Remember your old “magic set” and the wonderfully colored brews you mixed? And the surprises, and the fun? Today you’ll find there’s greater magic in tulips and even more gorgeous and beautiful colors packed away in their sleek brown bulbs. To work this new magic, think of the happiest flower colors and the prettiest combinations you ever yearned for Tulips require a period of cold while they’re dormant and resting between shows. 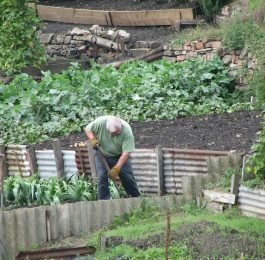 That means you must plant before freezing weather, then get your great display in the spring weeks of color if you know your tulips and plant early and late ones, and a lot of middle-between. Where do you want tulips in April? In May? Decide that -and we can tell you what to plant. The ground should be moist when tulips are planted. 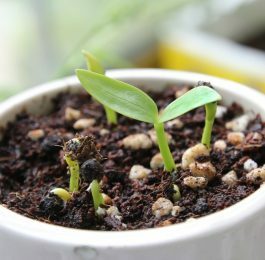 Give them two to four weeks to start their roots before watering. Tulips should not have too much moisture before they have made roots; in that condition, they are easy victims to rot or other infections. Your big opportunity to surprise yourself, your family, and your neighbors with the earliest tulips in the neighborhood rests in those listed as species tulips. Even in this group, there are earlier- and later-blooming kinds. So mind the E’s, M’s (midseason), and L’s you find in most of your bulb catalogs right after the variety names. After the species tulips get well started at blooming, come the Single Earlies and Double Earlies which are much better known. Then, in a rush of colors both delicate and rich, come those classed as Darwin, Lily-flowered, Cottage, Breeder, Late Double, and Parrot. These names refer to flower forms as well as colors, and border lines between the classes are often indefinite. 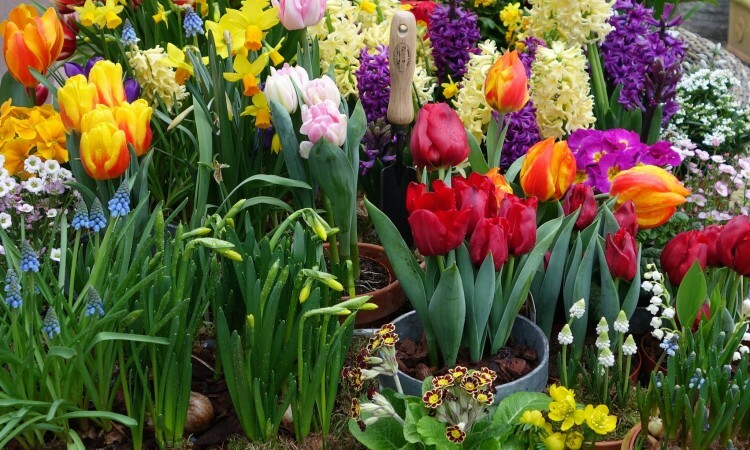 Where you plant your tulips, and with what is as important as which you plant and the quality of the bulbs, When you are advised to buy “top size” bulbs the term may seem vague and to need clarification. Tulip bulbs are graded according to the circumference. The largest four of about eight sizes are offered for sale to dealers. Allowances are made, of course, for varieties which are normally small. The biggest bulbs naturally produce the largest flowers. 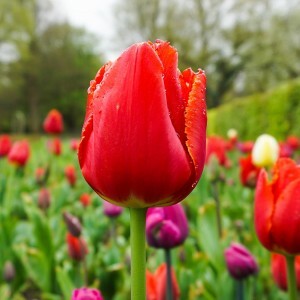 You will find over several years of experience with tulips that it is smartest to invest a few cents more and buy top size bulbs, This large, vitality-filled stock will give larger blooms three or four years in succession. of the kind you are planting, as they vary. Some are as low as 6 inches and some as tall as 15. Your catalog may list them as D for dwarf, M for medium, and T for tall. 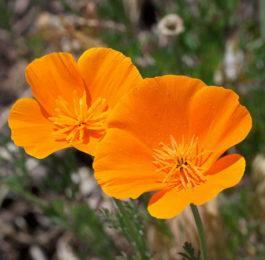 Don’t overcrowd them when planting; a spacing of 4 inches is none too much. The Waterlily tulips, Tulipa kaufmanniana, are dwarfs, but the earliest of all to flower. They look both fit and pert snuggled in the lee of a rocky outcrop or close to low junipers or pines. The basic color is like good Jersey cream, but the outer petals are striped and splashed with red. The blooms open flat in the noonday sun to the great delight of winter-wearybees. Bright blue Siberian scillas make fine neighbors, as do emerald mats of small Goldmoss, Sedum acre. Or plant these bulbs where their flowers will raise their brief inches from behind lilac-tinted moss phlox. away whether you plant them among rocks or close to a peony clump toward the front of a mixed border. Double Earlies. These look like small peonies set down on short straight stems. Mr. Van der Hoef is a bright clean yellow, Vuurbaak and Scarlet Cai nival excellent reds, Electra, deep rosy violet. The reds and yellows make nice masses of color below Garland spirea. Rosy pink Peach-blossom is never prettier than when set below Pink Double flowering plum in a mass of blue violets. Darwins. This class has tall stems-24 to 32 inches, and blocky cup-shape flowers. They bloom with lilacs, Van Houtte spirea, and the intermediate iris. Five outstanding Darwins are: Gloria Swanson-an enormous crimson set off by a blue center, Scotch Lassie-a pure, deep lavender that charms everyone when it’s grown near a soft yellow variety like Niphetos-or below a Father Hugo’s Rose. Zwanenburg is a pure white of lasting substance. The Bishop is one of the finer dark purples, excellent as contrast for pale pins and lavenders. nearby. Rosabella–a delectable pink, Marjorie Bowen-salmon, buff, and rose-pink, and Golden Harvest-deep lemon-yellow, are samples of this class. English Daisies and blue bedding violas in front of them guarantee they’ll show off at their best. and Cottage tulips, those in the lily-flowered class look the prettier if set among forget-me-nots or near mats of moss phlox such as Vivid and Dixie Brilliant. Breeders. Unusual art shades and smoky overlays of hazy lavender and purples mark this group. They’re excellent cut flowers to arrange in brass and copper. Plant near purple honesty, the golden daisylike doronicums, orange and yellow wallflowers, or yellow and bronzy pansies. Purple-leaf Filbert and Copper Beech make the most handsome of all backgrounds for them. Ask for Bacchus-violet blue with a dusky bloom, Cherbourg-a golden terra cotta, and wood brown Indian Chief. Late Doubles. These have heads so heavy they often need to be staked if rains are frequent. Eros-rosy lavender, Mount Tacoma-a handsome white, and Uncle Tom-a blackish red are the boldest of the group. These are in full bloom when the early iris start. Blue polemoniurn or pale blue bedding violas help set off the big pompon blooms. Parrots. These oddest of tulips are growing in favor each spring, now that the newer varieties have good stiff stems. With fringed edges and bold splashes of green on their outer petals, they do look as though made of feathers. There’s a good color range and you can have Red Champion, Violet Queen, the sparkling yellow Sunshine, vivid scarlet Therese, and the salmon-pink, Fantasy. All make beautiful cut flowers and all look the lovelier outdoors for having a groundcover about them of dwarf blue veronicas and Spotted Pulmonaria. If you water them early when buds are rising, you’ll get larger blooms and taller stems?